Posted Sunday, February 10th, 2013 by Robyn Warner. Chocolates are always good. Roses will never fail. But the simple fact is that chocolate and roses are, let’s face it, predictable and almost cliche’ at this point. We’re here to help you make a real impression this Valentine’s Day, to make it truly one to remember. All you need for this project is a printer, inkjet cartridges, patterned card stock and some lace to tie it all together. The procedure, outlined by the terrific people at Better Homes & Gardens, is painless (even more so than yesterday’s idea). Cut out oversize hearts from patterned card stock. Cut parallel vertical slits near the center of each heart. Thread valentine-themed ribbon through the slits. That’s it! Here’s how BH&G makes it look. “Beribboned Hearts Garland” via Better Homes & Gardens. Now, we don’t imagine ours would look anything like BH&G’s example, we simply don’t cut that well. But believe us when we tell you that if you pulled this off for your significant other, those minor imperfections along the edges of the heart will become magnificent memories for a long, long time. Need more convincing that this is the way to go this Valentine’s Day? It’s cheaper, easier to clean up, and longer-lasting than a generic scattering of rose petals, and less of a fire hazard than lighting dozens of candles. If you do this project, let us know how it turned out in the COMMENTS below. 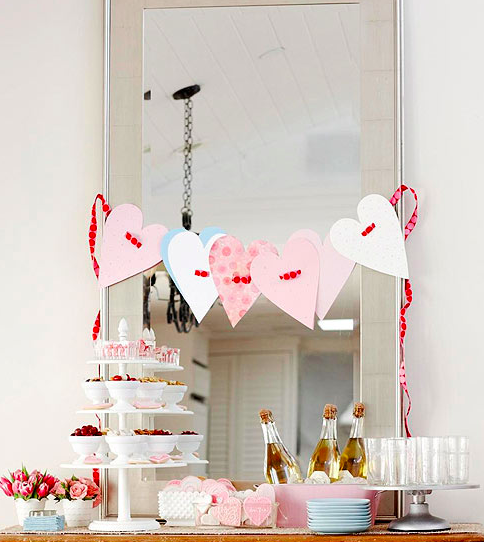 For more DIY Valentine’s Day crafts, check out our free guide.